As the old saying goes, "nothing beats the freshness and flavor of a homegrown tomato." This statement holds up every time, but what happens when home is an apartment or townhouse offering up just a sunny patio? Well, you grow tomatoes anyway! Although they are typically seen as bulky bushes, tomato plants are actually highly adaptable and can be easily trained to grow in a container setting. With tomatoes, there's always a way to achieve great success. In this guide, we'll walk through the basics of container gardening with tomatoes, and also discover some tips that will keep your plants thriving throughout the season! Come learn how to grow patio tomatoes today! Zapotec Ribbed Heirloom Tomatoes. Patio grown 2013. Are Patio Tomatoes for Me? Traditionally speaking, tomatoes are planted in the ground. Here, their roots are able to extend deep down in the hunt for stable soil moisture. Underground, the moisture levels are a lot less likely to fluctuate, lending a hand for much healthier tomatoes. In a container, things are much different! With a defined soil volume, the moisture available to tomato plant roots can rapidly fluctuate if not monitored closely. Drastic changes in soil moisture can reek havoc on tomato plants, causing them to grow stunted, or even to produce fruits prone to blossom end rot. To prevent moisture fluctuations from occurring, the gardener must constantly monitor and water appropriately. This entails a lot of time and dedication. Overall, if you're planning on growing patio tomatoes, just be sure that you have the time to monitor your tomato plants on a daily basis! To grow healthy and productive container tomato plants, you're going to want to replicate an "in-ground" setting as much as possible. Luckily, this can be easily achieved! 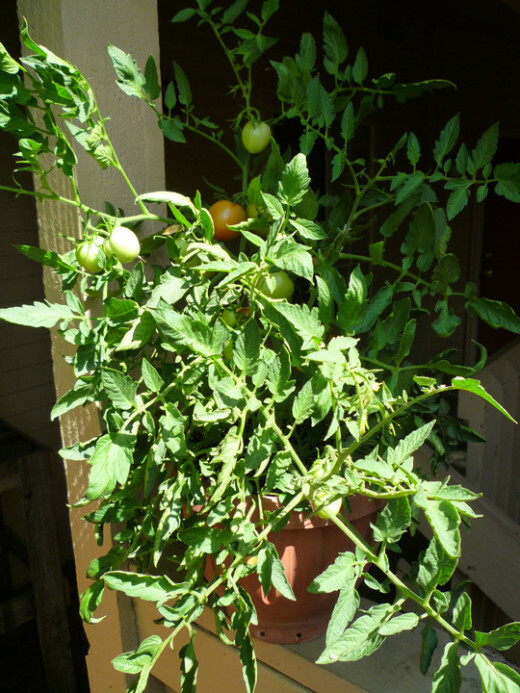 Plant tomatoes in a large container. This reclaimed wood planter has a soil volume of 20 gallons. Plant tomatoes deep in the soil to establish a strong root system. Full Sunlight - While tomatoes have adapted to growing in planters, they haven't yet adapted to growing in shady conditions. 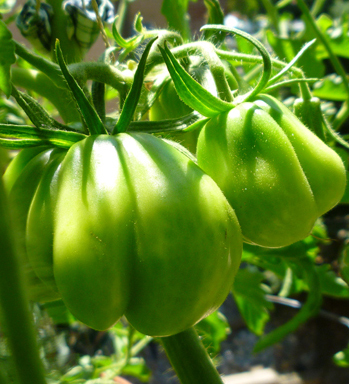 For proper growth and production of fruits, tomato plants need at least six hours of direct sunlight on a daily basis. Growth and tomato production will of course increase when daily sunlight exposure raises above six hours. Overall, the more sunlight you have, the better your potential! Fertile & Well Draining Soil - Tomato plants are notorious for having quite the appetite, so the soil they're grown in must be able to meet the challenge. 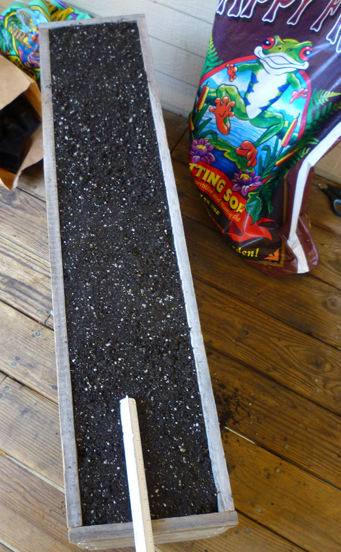 The potting soil should have a high quality compost at its core, and plenty of perlite or vermiculite for drainage. Although it can get pricey for quality bags of soil, skimping out here could mean the difference between a mediocre crop and an exceptional one! Large Planter - The bigger the container, the better the production. Although tomato plants can produce fruit in containers as small as two gallons, the minimum size you should be shooting for is five gallons. 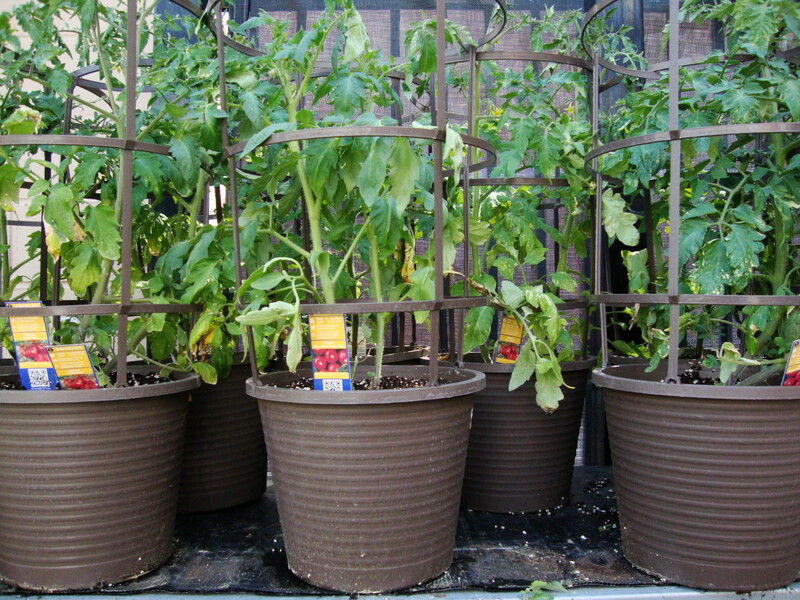 Larger containers in the range of 10-20 gallons will be able to support much larger tomato plants. When selecting your container, also note that wood and clay planters are much more beneficial than plastic ones. These porous containers allow essential oxygen to flow through the soil, creating an environment that tomato roots thrive in! Plastic containers tend to hold in too much soil moisture, creating a low oxygen environment that can stunt root growth, or cause rot. With the basics of patio tomatoes out of the way, we can now move onto helpful tips that will keep their growth and health at a maximum! These hints will not only keep your plants happy, they'll save you from a lot headache later on in the season. Patio tomatoes 2013. 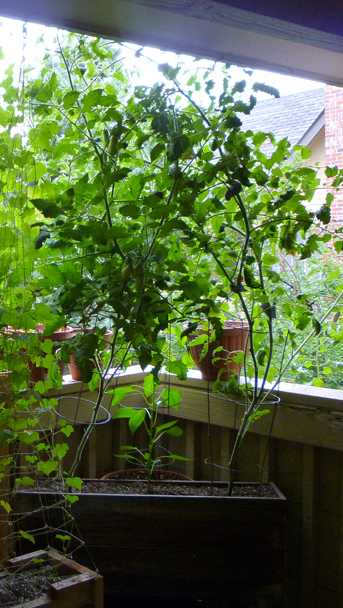 On the left is a San Marzano tomato plant. The right is a Zapotec Ribbed Heirloom. As I was looking for a challenge, both plants are indeterminate. Produces abundant fruits. Perfect for canning. Produces small 2-4oz green tomatoes with light green stripes. Small cherry tomato that stays under 2 feet tall! Grow Tomatoes from Seed - Unless you're buying from a reputable nursery that raises their own, tomato plants purchased from the store are typically a risky buy. The reasons behind this are that you most often do not know how old the plants are, where they were grown, or if they were exposed to toxic fertilizers. All of these factors can lead to problems, so be safe rather than sorry and just grow your own. Plant a Container Friendly Variety - Most tomato plants will grow in containers, but there are some that do better than others. 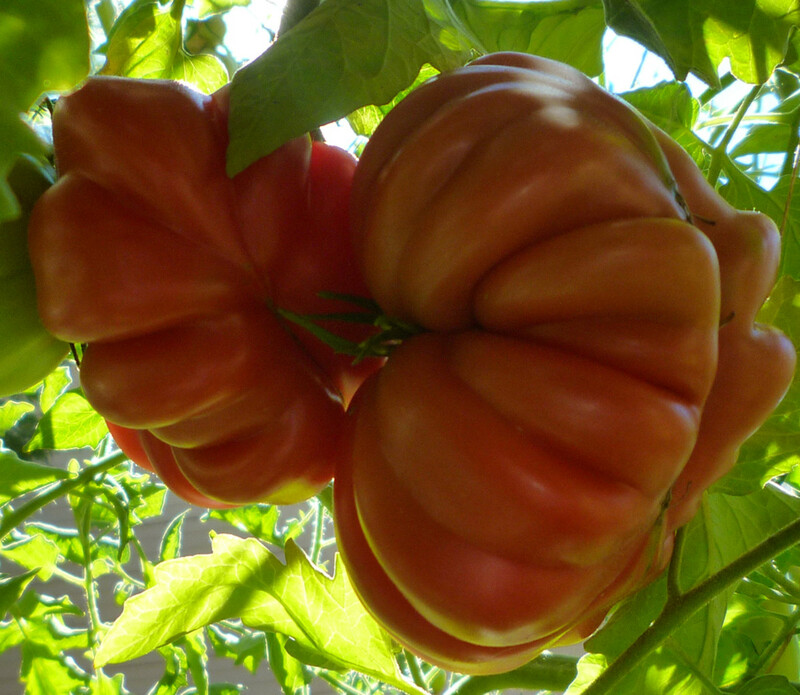 Planting tomatoes that produce small to medium sized fruits will greatly increase your chances of success. 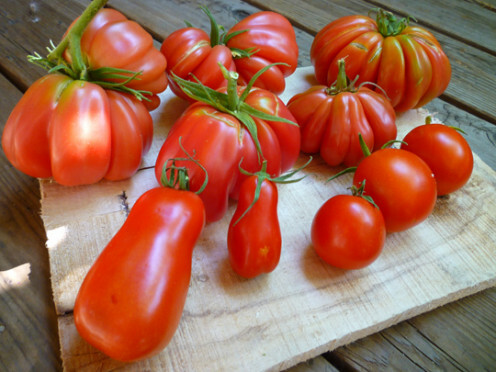 Large tomato varieties (fruits weighing more than 1/2 pound), require a lot more nutrition and may be hindered from the lack of root space in a container. Determinate over Indeterminate - The varieties listed to the right are of a determinate nature, and there's a good reason for this! Determinate tomato varieties tend to grow shorter in terms of overall height. Compared to indeterminate tomato varieties that can reach heights of 6-8 feet tall, determinate plants typically top out around 3-4 feet. For the patio gardener, these heights are much easier to manage. Nearing late summer, both tomato plants had easily outgrown their containers. Adding extra twine supports for growing branches, these plants reached in excess of six feet tall! Hiding out of reach, this Heinz tomato plant was my best producer of the season. I would have supported it a bit better if the other tomato plants weren't in the way! Use Tomato Cages - Tomato cages might sound like a bit of overkill for a container garden, but trust me, you're going to want to have them! Sure, it might take a bit of creativity to secure each cage to its planter, but when in place, the cage will provide a crucial support structure for growing tomato branches and shoots. This support will allow the plant to focus more energy into fruit production, and will also protect the plants from major damage during windy weather. Compost Tea - Let the natural nutrition of compost tea be the fertilizer in your garden! Feed tomato plants with a soil application once a week to deliver steady nutrition to hungry roots. In addition to soil feeding, spray the upper and under sides of the tomato foliage on a bi-weekly basis with compost tea. Not only will the tomato leaves absorb available nutrients directly into their leaves, the compost tea also creates a thin film on the foliage that acts as a natural insect barrier! Tomatoes grown on my patio in 2013. Slow Release Nutrition - Besides a quality potting soil and a drink of weekly compost tea, the only other source of nutrition for my tomato plants comes in the form of slow release organic bone meal. When transplanting the tomato plants into their final container, spread 1/3 cup of bone meal below and around each plant. As it breaks down over the next couple of months, the bone meal will release essential phosphorus, calcium and nitrogen into the soil. These nutrients (especially the phosphorus), will help keep the tomato plants healthy and fruitful as they begin to flower later in the season! I grow them in the ground. I grow them in containers. I grow them both in the ground and in containers. Keeping in mind the information from above, you'll be well on your way to producing some quality tomato plants this season! Although it seems that there's a lot to take into consideration, it's really all just a part of being a proactive and caring gardener. 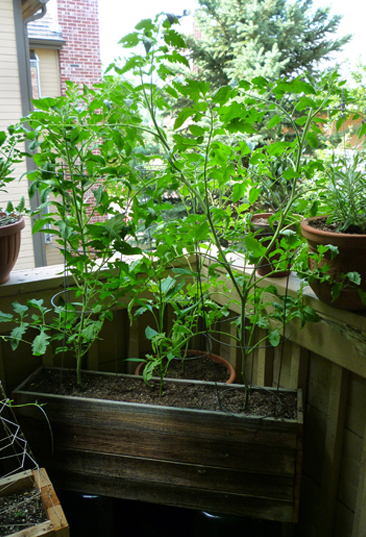 Thanks for reading this guide on how to grow patio tomatoes. Please feel free to share any comments, questions, or experiences you've had regarding this matter. Patio tomatoes from the 2013 season. Starting from the left: Heinz 2274, San Marzano, Zapotec Pleated Tomato. Zach, what an inquisitive idea. I'll keep this in mind for next spring's container plant selection and add patio tomatoes to the list. I never heard of it. But it's a brilliant idea. Thanks for this handy hub with insightful directions and photos to go with it. One green thumbs up! Never had a green thumb, but I love tomato soup. Maybe I'll try potting instead of planting. Although admittedly, whenever a plant dies under my care, I feel like the zoo that killed four lions. Good helpful hub on growing tomatoes. Nice hub for people who don't have a lot of space.